This page is primarily intended to include the main undertakings by each monarch at Windsor such as buildings, renovation, and structural additions. This area will feature more illustrations of the Kings and Queens of England as time permits. Known as the 'Hammer' of the Scots, he brought the Coronation Stone to Westminster, created his son first Prince of Wales, and commemorated death of his first wife, Eleanor of Castile, by erecting memorials at each halting place of the funeral procession from Nottinghamshire to Westminster - the Eleanor Crosses. Edward I stayed often at the Castle and made Windsor a Free Borough and granted the town its first Charter in 1276. Buried at Westminster Abbey. Born at Windsor, and known as Edward of Windsor. He pulled down a great part of the old Castle and rebuilt it on stronger lines. The Round Tower, Edward III Tower, the Norman Gateway, King John's Tower and several other important parts of the Castle were built by Edward. Plunged England into fruitless '100 Years War', his son, The Black Prince, was most renowned warrior in Europe. Buried at Westminster Abbey. Courageous but unbalanced. Ultimately deposed. Died mysteriously in Pontefract Castle. Buried first at Kings Langley, afterwards Westminster Abbey. Bolingbroke. Orthodox, devout, son of John of Gaunt, and twice married. Buried at Canterbury. Killed at Battle of Bosworth Field on 22nd August 1485. For centuries the whereabouts of his human remains was unknown. There is a memorial plaque in Leicester Cathedral where it was thought that he may have been buried, but that his body was moved during the Dissolution of the Monasteries. Another tradition had it that his body was thrown into the nearby River Soar, which means it could have ended up anywhere. Born on the 28th June 1491, Henry was an impressive and shrewd man, yet selfish. In 1509 Henry became king at the age of only 19 following the death of his father King Henry VII. 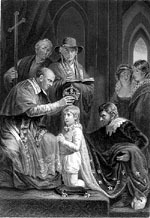 Henry desperately wanted a son and heir and this led to the creation of the Church of England as a result of his long running disputes with the Catholic Church and the Pope in Rome over his right to divorce two of his six wives. Henry declared himself Supreme Head of the Church of England and was responsible for the dissolution of the monasteries. He also founded the Royal Armouries in 1515 at Greenwich Palace. Henry VIII ruled until his death on the 28th January 1547. He is buried in St. George's Chapel at Windsor Castle. One of his favourite ships, the Mary Rose, was lifted from the bottom of the Solent in the 1980s and is now on display at Portsmouth. Henry VIII built the great gateway which bears his name and completed the stone roof of St George's Chapel. Embittered daughter of Henry VIII and Catherine of Aragon. "Bloody Mary" - Married Philip of Spain. Majestic daughter of Henry VIII and Anne Boleyn. Saw England rise to be a first class power. Brilliant, cynical. Knew defeat, exile and poverty. Married Portuguese princess, Catherine of Braganza. Fled to France, where he died. Married twice. Buried at St. Germains, France. 1685 Deposed 1688. During his reign England lost the American colonies. George III married Charlotte of Mecklenburg-Strelitz in 1761 to whom he was devoted. The couple had fifteen children, nine sons and six daughters. At Windsor, he excavated the Royal Tomb House under the Albert Memorial Chapel and commenced a number of restorations which were to be completed by his son, George IV. George III suffered from porphyria, a debilitating disease which affected him as early as 1765 and throughout the last years of his reign. George III died blind, deaf and mad at Windsor Castle on January 29, 1820. Buried at Windsor in St George's Chapel. Served 10 years in the Navy. Married Adelaide of Saxe-Meiningen. Crowned at 18, reigned for 64 years. Married Albert of Saxe-Coburg. Man of the world and keen sportsman. Married Alexandra of Denmark. Died Sandringham. Married Victoria Mary of Teck (Queen Mary). Died Sandringham. Born 23rd June 1894. Died 28th May 1972. Buried in the grounds of Frogmore House. A very popular monarch. Despite many family difficulties over the years, Queen Elizabeth remains widely respected worldwide. By this time modernisation of the Castle, in terms of structural alterations, was out of favour. It would be impossible today to make the major external alterations that took place, say, in George IV's reign. A number of changes were however incorporated following the Windsor Castle Fire of November 1992. These alterations, although highly successful, would not otherwise have been incorporated.